In Small Things Remembered » President John F. Kennedy and King Zahir Shah during the Monarch’s visit to the United States. 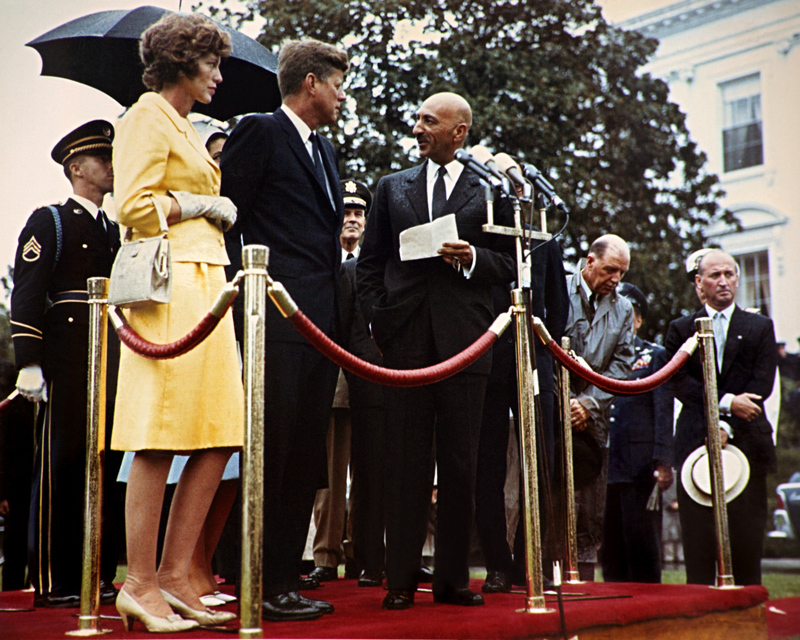 President John F. Kennedy and King Zahir Shah during the Monarch’s visit to the United States. a. Remarks on the White House lawn. L to R: Eunice Kennedy Shriver, the President’s sister; Kennedy; the King; John M. Steeves, U.S. Ambassador to Afghanistan; unidentified. 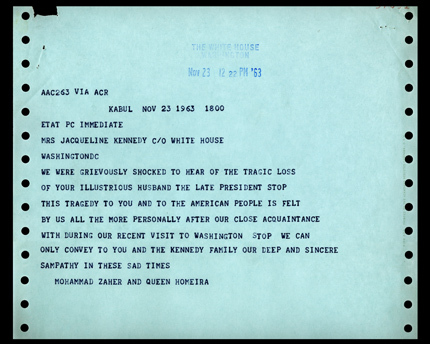 b. Condolence telegram to Mrs. Jacqueline Kennedy. 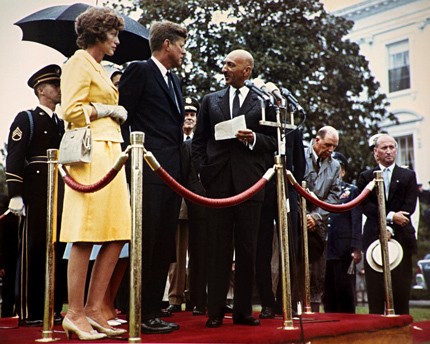 King Zahir Shah and Queen Homeira spent time with President Kennedy and his family, enjoying luncheons and dinners at the Afghan Embassy and the White House. Only weeks after their return to Kabul, the Royal couple was shocked to hear of Kennedy’s assassination and sent condolences to his grieving widow. While the friendship between the King and the President was unfortunately short-lived, the goodwill between Afghanistan and the United States continued. 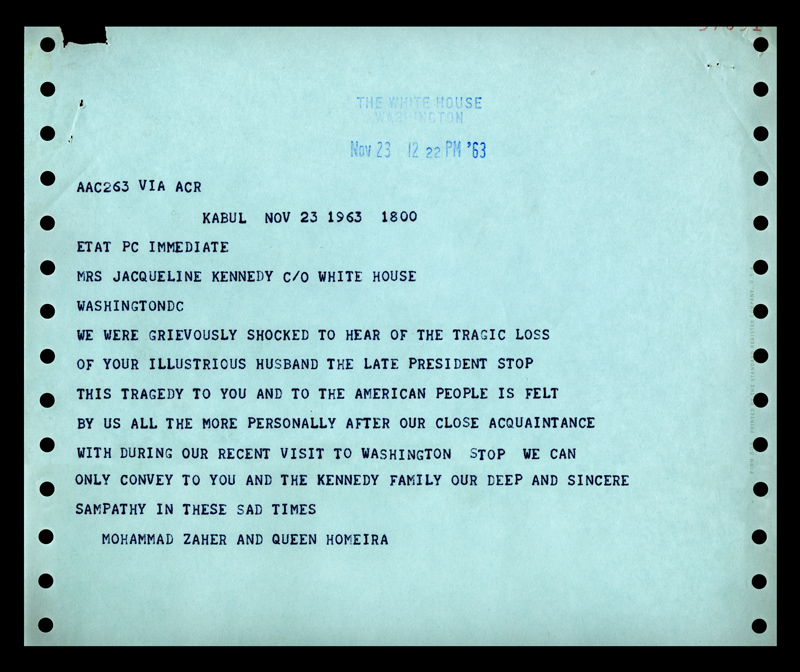 Document courtesy of the John F. Kennedy Presidential Library and Museum. Condolence Mail Collection.